Roof Moss Removal, Organic Treatment and Pressure Washing in Portland "Prices: Local Organic, Green Roof, Vinyl Siding Cleaning Services, Pressure, Gutter Washing near me in Portland." Untended foliage that limits access to work areas. Pitch of the roof, square footage, water spigot pressure. This is the hardest service to estimate without seeing the roof in person. We always offer free on-site estimates. So we usually prefer to come and look at your roof in person. • Prices starts at $175 for annual Organic full roof moss treatment. 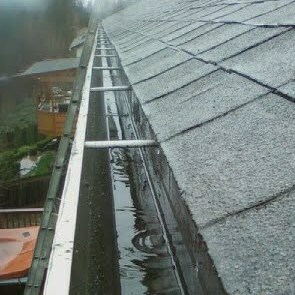 And for moss removal/treatment on roofs, price varies so we like to see the roof. • Debris collection and disposal into your bin or compost site is never charged. Excess debris that can be left in yard debris bags for you to dispose of later is no charge. • The price for a driveway starts around $90. • Many want the sidewalk in front of the drive or house done for safety reasons. Starting price of $90. • For walkways under heavy shade or with frequent moss growth, we offer non-organic treatment that can lengthen time between cleanings. (Labor/product) starts at $90. • We do not pressure wash roofs. Not even concrete tile or cedar shake. • Cages and protectors are recommended on a case-by-case basis. See our Do It Yourself page for some of our favorite inexpensive options. • Ground-floor windows (no ladder)- $5 per PANE for both interior and exterior. • Second-floor windows (ladder)- $6 per PANE for both interior and exterior. • Exterior-only windows - Ground-floor and Second-floor $4 per PANE. • Interior or Exterior fixtures, chandeliers - Starting at $10. • Skylights and Solar Panels - Starting at $15 each. • Don't worry. We break it all down for you in your estimate. • Fence Cleaning: Some fences are easier to clean due to either the material used to build it or what needs to be cleaned off the fence, for example, algae or dirt, etc. So we are unable to give an email or phone estimate, we have to come in person to see. Of course, free of charge. • Deck Cleaning: Some decks are made with better quality materials than others, so we also need to come in person to give an accurate estimate. • House Washing: The quality of the siding materials, the square footage of the house are factors in determining the cleaning estimate, we need to come in person to see this.